As of last week there have been over 500 confirmed cases in the Bay area, Sacramento, Reno, and now Carson areas. THIS IS A HIGHLY CONTAGIOUS VIRUS! We are now carrying the Bivalent Influenza vaccine and are recommending to every client to vaccinate their dogs today to help prevent this widespread virus from taking over the Basin. Symptoms of this virus include: coughing, sneezing, ocular and nasal discharge, fever, loss of appetite. If untreated your pets health could drastically decrease. Here at Sierra Animal Hospital our emergency staff has been called in to treat two dogs that had a bad encounter with baby porcupines. It is EARLY in the season and we would like to let our clients know that the danger exists. These little guys were found on Lower Kingsbury Grade in South Lake Tahoe. Every spring/summer, for as long as I remember, we have been called in to remove quills from adventurous dogs, often hiking in the Fallen Leaf area. Enjoy hiking in the basin and remember to watch for wildlife. Heartworm disease is a tricky subject for pets in the South Lake Tahoe. 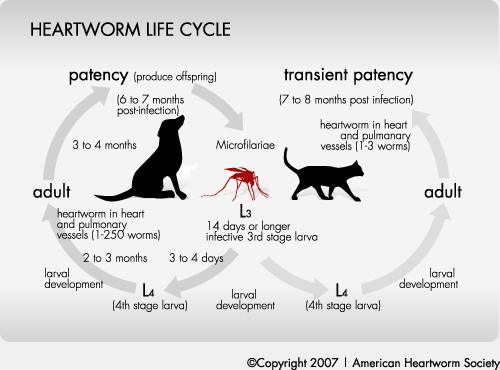 Heartworm is a parasite spread by mosquitoes to dogs and cats when the mosquito bites them. The parasites start off as small worms that live in the pet’s bloodstream that then grow into adults over a six month period. The adult worms live in the heart and the blood vessels of the lungs. If gone untreated, they will eventually cause irreversible damage to the heart and lungs, resulting in death. The good news is that the disease is easily preventable with once a month medication. Also, if an animal gets heartworm disease, and it is detected early, it can be treated and resolved with great success. For these reasons, monthly prevention and checking heartworm status with blood tests is very important. Where the subject becomes tricky is that heartworm disease seems to only exist in the mosquito populations at certain altitudes and climates. In the South Lake Tahoe, heartworm has not been detected in the mosquito population. In teh Carson Valley, it has been detected but it is not prevelant. However, the Placerville/Grass Valley/Auburn areas have more heartworm disease than almost anywhere else in California. The Carson Valley, Sacramento, the Bay Area, and all other areas below 4000 feet have heartworm disease. Since heartworm can be spread by a single mosquito bite, I RECOMMEND THAT ALL PETS THAT TRAVEL AT ALL, EVEN INFREQUENTLY, BE ON HEARTWORM PREVENTION. To avoid confusion since the heartworm test only becomes positive six months after a pet is bitten by an infected mosquito, I recommend that animals be placed on monthly prevention and kept on it year-round. Taking animals on and off prevention without testing them at precisely the correct time, can lead to heartworm slipping through the cracks and infecting pets on prevention that is not given regularly. SUMMARY: I recommend monthly heartworm prevention given year-round for all pets that travel- even to the Carson Valley which has recently shown evidence of mosquitos that carry heartworm. I also recommend a heartworm test every two to three years to insure nothing has slipped through. So, if you travel with your pet to Placerville, Sacramento, the Bay Area, Southern California, Mexico or the Carson Valley, they should be on heartworm prevention. Please also note that we have to do a physical exam on your pet within a year of prescribing heartworm prevention in order to abide by California Veterinary Board requirements. We realize this is an inconvenience in some cases, but it is required by the California board. It does, however, provide us with the opportunity to do a full physical exam on your pet to evaluate for any health issues and provide you with an opportunity to ask the veterinarian any questions you may have. Please ask a member of our staff if you have any questions.